Looking for private in-home or in-studio Viola lessons? Our El Cerrito teachers are ready to get you started. Find your teacher today! Check out some of our most popular teachers near El Cerrito, CA including San Francisco, San Jose, Sunnyvale, Oakland and Palo Alto. Comprehensive and fun lessons focusing on musicality, technique and music theory for all ages. Hello and welcome to takelessons.com! My name is Jessica and I am classically trained violinist with over 19 years of playing experience. I was born and raised in Baltimore, Maryland and recently relocated to Saint Louis with my family. Music has always been passion of mine since a very young age, so it was inevitable that it would end up being my career. Naturally, a love for teaching the wonders of music followed suit! I always try to form a great rapport with my students and parents from the very first lesson. For younger students, I encourage my parents to take an active part in both lessons and daily practice, as is encouraged by Shinichi Suzuki. various music schools, summer camps and festivals. A few advanced students have even attended and performed in some of these aforementioned festivals! I am always encouraging my students to go above and beyond. A bit of background about me: I started my music studies at the age of 7. Lessons and orchestra were literally the highlight of my childhood. I ended up attending the Baltimore School for the Arts for high school, and went on to receive my Bachelor of Music Performance degree from Shenandoah University and complete further studies in England, Northern Ireland and Maryland (UMBC graduate certificate). I am also a registered Suzuki Violin/Viola teacher and have attended many teachers workshops in order to gain the knowledge and experience necessary to work with any and all types of students, including those with learning disabilities, such as ADD and FAS. While I am a registered Suzuki violin teacher, I do not teach solely out of a certain method or "by the book"; I choose and mold every lesson depending on specific, strengths, weaknesses, etc. If you are a more advanced, serious player, more intensive lessons and repertoire will follow suit. I am comfortable teaching all ages and levels up to advanced. Use of games make learning the violin fun and accessible for young children. Older and more advanced students receive a more technical, intensive and advanced approach. Coaching and weekly help on school assigned materials (orchestra/string class music and homework) Classical, Jazz, Gypsy and Fiddle styles are all introduced and studied to give students a rounded technique. Music theory (reading and understanding music) is incorporated in lessons. Repertoire is diverse and exciting. Various approaches for the visual or aural learner. Guaranteed to keep you or your child engaged and interested! -If you are coming to my home for lessons, please be sure to bring your instrument and any books you may already have. **Please note, there are three cats in the house. They are usually isolated to a different part of the house during lessons to ensure there are no unnecessary distractions and to help minimize potential allergies (studio is also sprayed with allergy reducer spray and vacuumed regularly). All are UTD on shots. Please call and ask to schedule a "trial" lesson to see if the animals interfere with allergies. You may park on Clayton Rd outside our house or on the cul-de-sac next to the house and walk down. I have a trial 1/8, 1/4, 1/2, 3/4 size violin to use for the first lesson if your child is a beginner. After the first lesson I will send an email explaining what materials and equipment I recommend you buy to help you sound your best. Places to rent or buy instruments will be recommended upon request. 1) At least 24 hours notice is required if you need to cancel your, or your child's, lesson. You will be given the option to take a credit that will automatically roll over to cover future unpaid lessons on your calendar, or the option to reschedule for a different day within a week of the canceled lesson. 2) If you find that you need to cancel with less than 24 hours notice (I completely understand life happens, and sometimes it is unavoidable to provide 24hr notice), you will be given the option to make up your lesson within 7 calendar days of your originally scheduled lesson time. If you cannot do a makeup lesson, this will result in the lesson being marked as "missed" and will still be charged as if you attended the lesson. 3) If you do not show up to your lesson scheduled at my home studio and no notice was given, the lesson will be marked as "missed" and will still be charged as if you attended the lesson. 4) If I need to reschedule or cancel a lesson for whatever reason, you will be given an option for a makeup lesson or given a credit that will automatically roll over to cover future unpaid lessons. 5) I require two weeks notice to discontinue lessons if you would like to receive a refund or be exempt from paying future tuition. 6) All lessons are billed ahead of schedule and must be paid in advance in order to keep your lesson slot. Jessica has been a great instructor for this adult novice student. Jessica keeps the instructions interesting and challenging and adapts to the pace and preferences of the student while building foundations for this beginner. She is patient and made great adjustments on the fly. She understands limitations and assigned exercises that matched my gaps and progress to meet me where I am in the learning process. She was very knowledgeable, patient, and pleasant to work with. d also maintained my own private violin and viola studio. I was also awarded the McCracken Scholarship Award for Excellence in Music Education. The most rewarding part of teaching has been seeing my students continually improve and reach their goals! In addition to teaching, I also am an avid performer. I have been a member of the Lexington Philharmonic Orchestra for 7 years and was a member of the University of Kentucky Symphony Orchestra. I perform as a soloist, in chamber groups, and in orchestras regularly at various events and concerts. In the past few years I have attended international chamber music festivals in Prague, Czech Republic and in Lucca, Italy. I have also had the opportunity to perform with some of the world’s most renowned musicians including Itzhak Perlman, Midori, and Gil Shaham in additional to performing in the Kennedy Center in Washington D.C. and in Carnegie Hall in New York City. Studying music has provided me with many wonderful opportunities to learn and to grow. It is my goal to help students really love and enjoy playing music and develop the skills that allow us to share the magic of beautiful sound. Maintaining a high level of mastery as well as continuing to learn about the art of teaching are fundamentally equal and of highest priority for me. Through teaching music, I hope to inspire students and help them reach their potential. My teaching style is relaxed and understanding of where each student is at, while always maintaining a quick pace for learning new skills and always expecting the student to put forth their best effort. I am very encouraging and positive. I work with each student and his or her parents to determine short and long term goals and try to best provide the materials, instruction and motivation to achieve those goals! I specialize in teaching classical music but I also teach bluegrass and fiddle. I particularly like the Suzuki Method for beginning to intermediate students, but when they become more advanced I begin to incorporate concertos and sonatas. Kristen was an amazing teacher! My daughter loved her. When we moved she was sad Kristen would no longer be her instructor. Kristen has been so patient with me and already taught me many things to help me be a better violist. Many thanks! I enjoy encouraging beginning & intermediate viola students to develop a love of the instrument and solid technique! I can also help an advanced student who's interested in fiddle repertoire. Improving these skills can greatly increase the enjoyment of playing in students. My teachings will assist you in working on orchestral repertoire, solo pieces and any other musical interest you would like to learn about. Students of mine have gone on to advance to audition-only groups. Every student is unique, so I will tailor the lessons to you and make it fun! I'm passing on to you the training I received from the very best master teachers of the violin. Stringed instruments are challenging, but I believe in enjoying making music at every level, while establishing a strong foundation in good technique. For learning fundamentals of music theory and ear training, we will play various rhythm and improvisational games. I have extensive background in European classical music, and I've also done quite a bit of improvisation, some fiddling, and electric violin and viola. Whether you want to be the next Joshua Bell or the next Lindsey Stirling, I can help you improve your playing. I will help you sing, dance and tell a story through your violin or viola. Born into a musical family in 1966, I have extensive performance experience as a classical violinist and violist, and I've been composing my own music since 2000. I am very grateful to have studied with some of the finest teachers of violin, viola and chamber music, and I graduated in 1990 from the Curtis Institute of Music in Philadelphia, one of the best conservatories in the world. I've played often with the Philadelphia Orchestra and the San Francisco Symphony, and I was the Concertmaster of the Chamber Orchestra of Philadelphia for 6 years. I'd like to pass on the knowledge gained from my years of playing in orchestras, chamber groups and solo concerts. My teachers taught me the most refined techniques of tone production and continually showed me how to make the music come alive emotionally and tell a story. ed a lot of music by contemporary composers, in groups like Network for New Music and Orchestra 2001 in Philadelphia, as well as Left Coast Chamber Ensemble in the Bay area. Some special tours I went on were with the Philip Glass Ensemble and with Tan Dun, the composer of Crouching Tiger, Hidden Dragon. My own compositional adventures started in the the late 1990's when I started improvising with a DJ mix in a small club. Since then I have experimented a lot with pickups and electric violin. I've created surround sound collages, improvised music for modern dance, and learned digital audio editing skills. I am knowledgable about Pro Tools and Ableton Live. If you are interested in electric violin, looping or using MIDI effects, I can share what I've learned about these things. You can make music and be creative no matter what playing level you are on. I believe in having fun as you learn, and I stress learning by example and by ear. Reading music is good, too, but often that gets in the way of listening. We will build a foundation step by step and add on elements when you are ready. Also - I can help you be relaxed as you play. I have never had tendonitis or another occupational injury, thanks to good posture and technique. Body awareness is part of the process. Let's have fun- - you can do this! NOTE: for students age 7 to 12, I require the parent to be present at the lesson and take an active interest in the student's progress. Also, the child must want to play this instrument. Gloria has been a wonderful and inspiring teacher over a period of very formative years for me as a violinist. We first worked together for all 4 years of my undergraduate violin performance degree at Mills College from 2010-14, and Gloria helped me develop a lasting appreciation for listening deeply and developing focus for small details. We worked together on everything from solo Bach and Hindemith sonatas to concertos, chamber music, and orchestral excerpts. She has been a lasting influence in my life as a musician, and I will continue to return for musical and creative advice over the years even when I live far away. My aim as a teacher is to set students up for success with a relaxed, comfortable technique so that they can produce a beautiful sound soon and become expressive musicians. I believe that people love to do what they can do well! My job is to give students the tools for excellence. With the knowledge passed down to me from my teachers from the Moscow Conservatory and my passion for helping others learn, I tailor what I teach to the goals, the personality, and the hands of each student. Whether you want to take a traditional classical path towards a professional career, or whether you just want to learn to play for fun, I can help you achieve your goals. I am a professional freelance violinist and teacher living in San Francisco. 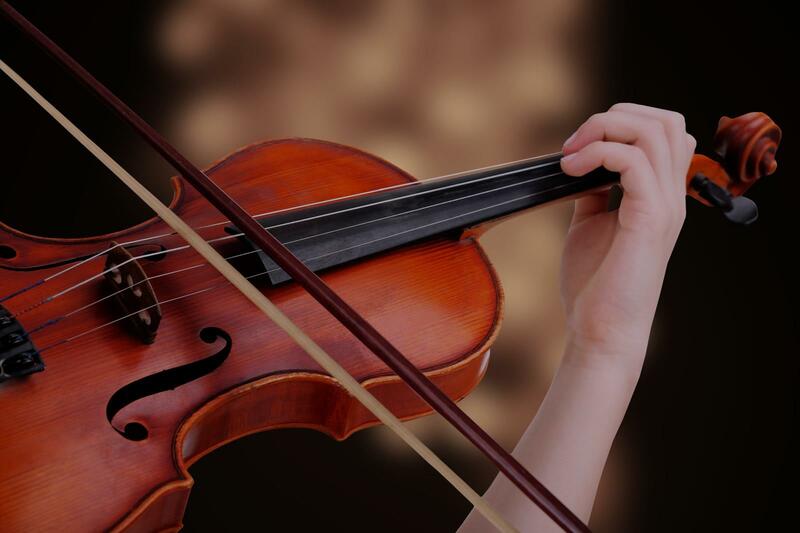 I began studying violin at the age of 5 and have had the privilege of studying with renowned teachers who taught at Moscow Conservatory, Stanford, and Curtis Institute of Music. I have performed violin and viola in North and South America (including Carnegie Hall and the National Theater of Costa Rica) and in Europe. instrument so that they are free to play musically and expressively with confidence! I teach violin and viola students of all different ages and experience levels. I've studied classical violin for 24 years. I can teach students to read music and pursue excellence in a traditional classical way, or I can teach students how to play their favorite pop tunes, depending on students' personal goals. I currently serve as concertmaster of the Mozart to Mendelssohn Orchestra in San Francisco, lead chamber music nights with the SF Civic Music Association, and play gigs around the Bay Area. I love being a part of community music-making and believe that the benefits of music education reach far beyond the instrument itself to social and cognitive skills, confidence, and creativity. My personal passion is classical music but the kind of technique I teach applies to all styles, and I am experienced teaching fiddling, pop music, or whatever music inspires you. I look forward to meeting you and helping you to become a better musician! Michael is the best instructor ! He is very experienced with children , my son is four and a half years old and his attention focusing is short. Michael has a way to make the lesson so much fun and he is also very patient. My son loves to take lessons with him! Can't find a teacher in El Cerrito, CA? reasons: he's the epitome of a patient teacher (learning a stringed instrument requires a LOT of patience), he's punctual, and he's focused yet flexible (he's got a good sense of what you need to learn, but is willing to customize his lesson for you). I've enjoyed learning from Sam and am looking forward to more lessons!" San Francisco, CA teacher: Samuel N.
y to work and talk with, flexible with his schedule and gives wonderful feedback on how Ava's doing. He is patient, mild-mannered, attentive, encouraging, supportive, and he really makes the most of the time spent teaching Ava. It didn't take more than a few lessons until we can hear an improvement in Ava's playing. He nurtures the passion she has musically and his support as an instructor helps motivate her to become better with each lesson. She practices on her own without being reminded as she wants to be able to even make the slightest improvement between each lesson. It's great and we're lucky to have found the perfect instructor for Ava the first try:) Thank you! Sam:)"
rstand, did I say Patient!? I am a 28 year old man that is learning Viola as his "2nd" real instrument. I play piano well, and "campfire" guitar. Kristen is teaching me to read Alto clef and play the Viola. She is teaching at MY pace and not complaining when I come in without having the most practice time accomplished throughout the prior week. She has a flexible schedule and is available for communication (email and phone) between lessons (I've rescheduled many times because my work hours are not constant). She's Great! I hope you let her teach you! Thank you for reading." San Francisco, CA teacher: Kristen K.
hout out pacing her students. I highly recommend her as an instructor." layed a huge part in her doing well in her audition. He picked a complex piece for her solo which I felt had slow and fast movements and tempos, as well as emitted both a lighthearted and melancholy mood. The piece felt much like a roller coaster ride of sounds and emotions all in one piece. Sam has been and continues to be such a great fit for our daughter."